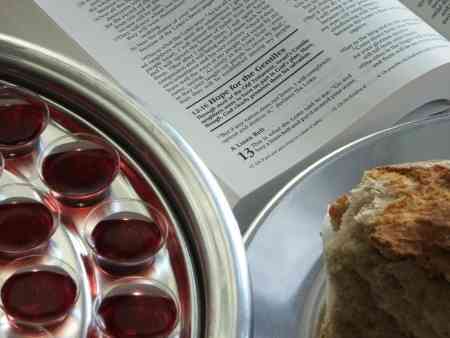 The Bible commands that Christians should take communion but what about children? Should children be allowed to take communion if they profess faith in Christ? What if they are not yet saved? The instructions that Paul gave for communion or the Lord’s Supper were given to the church and the church consists of members who have repented, seen the sinfulness of their sins, seen their need for a Savior, asked for God’s forgiveness, and then trusted in Christ. We should note that Paul wrote that Jesus did not say if you do this but “Do this in remembrance of me.” It is done to remember how His body was broken for our sakes and that His blood was shed for our forgiveness and we are to take the Lord’s Supper and when we do, or “as often as you eat this bread and drink this cup”, we are actually proclaiming “the Lord’s death until he comes” again. This is not a negotiable doctrine for the church to either choose to do it or decide not to do it; it’s commanded, at least for adults. But what about children? Should they take communion, and if so, is it only for those children of saved parents? Is it only for children who have professed faith in Christ or is it for any child old enough to understand what they are doing, saved or not? Almost every church consists of at least some members who were saved at a very young age and some denominations allowed these members when they were young children to take communion. Other denominations say that it’s only for adults, but what if a child understands what sin is, sees their need for the Savior, repents of their sins, and then puts their trusts in Christ, should they not also be able to take communion or the Lord’s Supper? Is communion intended only for believing adult members of the Body of Christ but not children who are believers? When Paul gave instructions to the Corinthian church, he didn’t single out that communion was only for adults so it would seem logical that we cannot exclude children who have come to saving faith in Christ. However, Paul gives a warning and perhaps a clue as to who should take communion. Is that person, whether an adult or child, mature enough to be able to discern exactly what the Lord’s Supper means? Paul wrote that for all of those who take communion, they should be able to examine themselves because anyone who eats and drinks without discerning the body can eat and drink judgment on themself (1 Cor 11:28-29). Is the child knowledgeable enough to be able to examine themselves? That is a critical issue because if they take communion “without discerning the body [they can bring] judgment on” themselves. Is the child who takes communion able to understand this? Do they know what it means to examine themselves or to be able to discern the body? For that matter, can the adult members to the same thing? Ultimately, by asking the young child questions, one may see if they understand what communion is all about. The parents and the pastor can ask the child who has professed faith in Christ if they know exactly what it means to examine themselves. Is the child also able to discern just what the bread and wine (or grape juice for children and many adults) means and why they are taking it? Do they know what these represent? Can they comprehend what the symbolism is? Can they understand the depth of the meaning of the broken bread and drink symbolizes the broken body of Jesus and the blood spilled on their behalf? Are they somber in recognizing this? Also, if a person has not professed faith in Christ after repentance, then most churches will not allow them to take the Lord’s Supper. Communion is only for members of the Body of Christ, the church. By excluding non-members, whether an adult or child, they are following biblical instructions and guidelines for who can and who cannot take the Lord’s Supper and it’s actually in their best interests and for their own good (1 Cor 11:28-30). The instructions that Paul gave for communion or the Lord’s Supper were given to the church and the church consists of members who have repented, seen the sinfulness of their sins, seen their need for a Savior, asked for God’s forgiveness, and then trusted in Christ. If the child or adult has not yet done this, then they are not able to discern what they actually eat or drink and they cannot possibly examine themselves in the light of what God has done for them through Jesus Christ. If they cannot do this, then they cannot or at least should not take communion, otherwise they run the danger of taking the Lord’s Supper in an unworthily manner (1 Cor 11:28-29). Paul reveals that for those who took communion in an unworthy manner or for some who might take it unworthily today, premature death could be the result (1 Cor 11:30). It was for some of those in the church at Corinth. That’s a risk you should not be willing to take, so if you have not yet repented and trusted in Christ, then I strongly urge you to not partake in the Lord’s Supper. My suggestion is that today you repent of your sins and trust your eternal future in Christ Jesus alone, while it is still called “today” (2 Cor 6:2). I was raised Roman Catholic, and as you know, was instructed that the bread and wine becomes the actual body and blood of Christ(Transubstantiation). The Lutheran church I infrequently(not a typo) attend makes folks take a course on what they believe Communion to be, which basically is that the bread and wine becomes the mystical body of Christ and just falls short of the physical, as the Roman Catholics believe. Even, if you are a believer, yet do not believe this point, you are told “Not” to partake. I do have a question about something I heard another pastor preach about awhile back. It centers around your warning that folks should be concerned about partaking in Communion “unworthily” if they are not saved. Do you believe that this warning was given to the church as well as non-believers? I personally, believe the warning was for the believer. If so, then who cares if the non-believer just comes up to get his belly full? Thanks Doc. I don’t believe this was given to unbelievers because Paul was writing this to the church specifically and to how they ought to conduct themselves and participate in the Lord’s Supper so if it was to unbelievers, since unbelievers are not even interested in reading the Bible, they surely wouldn’t care about such a warning about taking Communion in an unworthy manner. So I agree with you and do not agree with this pastor because the context and intended audience are for the church’s administrating the Lord’s Supper and for the believer’s taking such a sacred event not lightly but very seriously. I agree with the Christian Research and Apologetics Ministry as they say that it could be that those taking the communion elements needed to be fully aware that they represent the sacrifice of Christ by which we are redeemed from sin. Therefore, to participate in communion while not understanding this would be to take it in an unworthy manner. Another possibility is that taking the supper with willful, unconfessed sin would be in an unworthy manner. The earlier context of 1 Cor. 11 seems to suggest that taking communion in an unworthy manner means to do so while you have a problem with another Christian with whom you are not reconciled. Another view is that some Corinthian’s were using the communion supper as an opportunity for self-indulgence, which is why Paul mentioned about how some got drunk in verse 21. Also, the that both elements (bread and wine) must be taken, not just one (bread or wine) since Christ commanded that both be taken. This would, incidentally, invalidate the Roman Catholic practice of taking the wafer only. It could also be that the person taking communion must be worthy in order to take it. But this view, however, is dangerous because no one is worthy to take communion supper. Our worthiness comes from Christ, not ourselves. Hello, Pastor Jack! 😀 I seek not to divide anyone over this, but why are the Matthew and Mark accounts of the “greatest in heaven” debacle different? According to Matthew, the disciples simply asked Jesus who would be the greatest in Heaven, and Jesus rebuked them by setting a child in their midst. But according to Mark, the disciples were ARGUING who was greatest, Jesus asked what they were arguing about, and they stayed silent out of shame. Then Jesus set the child in their midst. Which one should I believe? Do I believe both of them? An argument arose among them (the talmidim) as to which of them should be considered the greatest. They arrived at K’far-Nachum. When Yeshua was inside the house, he asked them, “What were you discussing as we were traveling?” But they kept quiet; because on the way, they had been arguing with each other about who was the greatest. I moved recently from the West Coast to the East Coast to live with my daughter. I attend her church and the believe that any one, even small children, like my granddaughter who is 7, but even when she was 6 can take Communion. Any adult, also, weather there are saved or not are asked to take Communion. I have a problem with this and it bothers me that my daughter allows my granddaughter to take Communion. I know for a fact that my granddaughter does not understand what it truly means to take Communion or what it means to be a Christian. My daughter has been taking my granddaughter to church every since she was born, and she is doing right to do so, however, I wish she would understand that she is doing wrong and bringing judgement on herself by allowing my granddaughter to take Communion. I didn’t t know for sure weather what I was taught to believe was actually fact and true. This article just confirms my belief and I know now that I was taught right. How do I get my daughter to see this. I am going to find a new church that follows Jesus’ teachings on this. It is hard make others see things as we do. The more we try, the more they dig in their heels, and it may do more harm than good. Your granddaughter will figure this out when she’s old…but I pray your daughter sees this too because whoever eats and drinks in an unworthy manner is angering the Lord. I would just pray, find another church home, tellt he priest or pastor why you are leaving, and that’s all you can do. Any more pressure on your daughter might drive her away. This is really an interesting topic and I enjoyed reading the article…God bless you Pastor Wellman. Our worthiness is in Christ Jesus – no one is worthy or righteous on their own but through our Saviour, Jesus Christ. Once you acknowledge His (Jesus) perfect sacrifice and accept His invitation with gladness then you automatically become worthy/righteous, just that! – this is all about being a Christian then follows by what it’s expected of you to be doing as a Christian such as partaking in the Holy Communion. We don’t need to be worrisome about who’s worthy/righteous or not – God has made us worthy by us believing in Christ’s death and resurrection. It’s now the responsibility of every Christian homes, Churches including Sunday schools for children, and individual Christians to be promoting/teaching ‘being a Christian’ that I mentioned earlier in-respectful of age, among themselves and to unbelievers. Christian homes with children starting from 6 – 7 yrs old and above should be allowed to partake in the Holy Communion, as far as they can compose themselves and be patient enough during the Communion, from the start to finish. We should remember they are regarded as the Kingdom of God. Hello Zion. Thank you for your comment. As long as a child knows how to examine himself or herself to see if they are in the faith and understand about repentance and faith, they should be allowed so can a 6 or 7 year old understand? I think so. God’s Spirit reveals our need for the Savior, and so it is with a child. We partake communion at church. We don’t miss that moment. But would like to know if we can partake communion at home with our family? Hello Pedro. If you partake of communion at church, you wouldn’t need to do this at home. Maybe I am misunderstanding but its’ not the same because communion itself, or the name itself means “com” (with) “union” (unit) and in the New Testament church, communion was never done in a home but only when the church gathered together. Why do you wish to take communion at home when you can take it at church? I think I would stay with what the New Testament church did and they only took communion as a body, with union. You can’t do that at home with the body. I have a question. Even though we partake communion in our churches, can we take communion with our family gathering? Pedro, Respectfully, I believe that it is possible to take communion at home. The early Christian communities often (primarily?) met in people’s homes, and would have served communion there. Some ministers also serve communion to the sick/bedridden in hospitals and at home. We, believers in Jesus Christ, are the church…wherever we are. I look forward to taking communion during church services and do so as often as I can (my home church offers communion just once a month), but I can’t find anything in the Bible that says that communion must only be served and received in certain places. However, I do believe that one should prepare for Communion (through confession, repentance and prayer), and be a Christian in order to receive or serve it. Paul explains in 1 Cor. 7:14 that children with even one Christian parent are holy. How do you explain this? The Lord Supper was a continuation of the Passover in Exodus where the whole family took part at home including children. What do you say about this. Will a kid of a Christian parents go to hell or heaven if he or she dies at that age? The Lord’s Supper is different from the Passover of ancient Israel. The whole family may have taken part but the Lord’s Supper is for only those who have examined themselves before taking the Lord’s Supper and that it’s for the Body of CHrist, the church, so if you’re children know what it all means and have trusted in Christ, they can participate, but young children are never found to be partaking in the New Testament church. No child will go to hell if they are before the age of accountability, and we don’t know exactly when that is. Yes, children are sanctified, but that doesn’t mean they’re saved. The word used for holy or sanctified means “set apart” so it’s not talking about their spiritual status before God but their standing in a Christian family. The context of 1 Cor 7:14 has nothing at all to do with Communion. It is about divorce and remarriage, so this verse doesn’t fit the context of the Lord’s Supper which is way, way apart from this chapter. 1 Cor 11 is the context for Communion. I believe if we take Communion in an unworthy manner, not discerning the Lord’s Body as the Scriptures say. Good question Kay. A person should examine themselves, confess any known or unknown sin, and then take Communion. Previous post: What Is The Role Of A Mission Agency?